Flowerbomb Bloom by Viktor & Rolf - A new fruity floral fragrance for women. This is a fresh aerial version of the original Flowerbomb perfume. The latest Viktor&Rolf scent, created by perfumer Domitille Bertier, includes notes of liquid air accord, juicy pomegranate, and a floral bouquet. 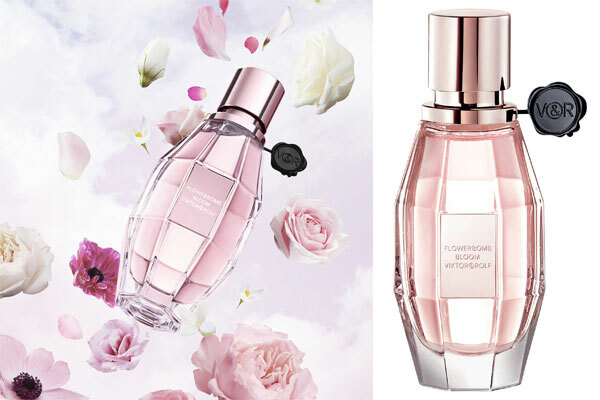 The original Flowerbomb grenade-shaped perfume is updated with a more slender design. Launched in January 2017 this new fragrance is available in an eau de toilette spray from Sephora. The ad campaign features model Andreea Diaconu photographed by Inez & Vinoodh. Package Design Original grenate shaped Flowerbomb perfume bottle with a slender design.